Set on small Douglas Island near Seattle, Killingsworth's (Circle Within a Circle) uneven novel details a week in the life of a 14-year-old girl. Autumn, the narrator, is upset when her father, Harley, announces that their family will be leaving the island; she likes their log cabin and the relaxed pace of life with her artisan dad and her commuter mom, who comes home only on weekends. Harley claims that Autumn needs a better school. (The true reason is revealed late in the book, when Autumn discovers that her mother and another woman have been lovers for years.) 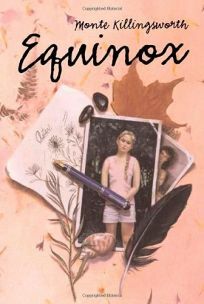 Autumn sets out to prove how much she already knows by writing and drawing everything she sees and hears in a journal. Her descriptions grow tedious, but the interactions between Autumn and her father, and with wise lighthouse keeper Forrest, breathe life into this quiet story. In one scene, Autumn makes lunch for her father, sets it by the door of his workshop, then hurries away so that he won't feel forced to talk. In another, she and Forrest make their own paper to cover her journal. These scenes demonstrate how familiar they are with each other and their routines and why Autumn is so adamant about staying. However, the more dramatic developments, such as the revelation about her mother, feel forced, and there may not be enough narrative tension to pull readers in. Ages 10-14. (Aug.).